FILE - An Afghan National Army (ANA) soldier keeps watch at a checkpoint on the Ghazni highway, in Maidan Shar, the capital of Wardak province, Aug. 12, 2018. Three U.S. service members were killed and 3 others wounded when an improvised explosive device detonated near Ghazni. 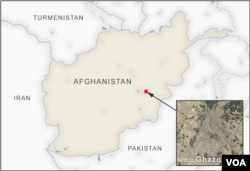 The U.S. military in Afghanistan says three of its service members were killed and three others wounded when an improvised explosive device exploded near the troubled central eastern city of Ghazni. An American contractor was also wounded in the blast. Ghazni is the capital of the Afghan province of the same name where the Taliban has overrun several districts in recent months. The insurgent group has recently come close to overrunning the provincial capital. FILE - Utah National Guard Honor Guard carry a casket containing the remains of Maj. Brent R. Taylor at the National Guard base, Nov. 14, 2018. in Salt Lake City. He was killed in Afghanistan. 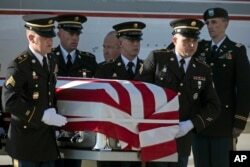 Tuesday's fatalities bring to 11 the number of American soldiers killed in action in Afghanistan this year. Hours earlier, NATO’s Resolute Support mission clarified its investigation into Saturday’s killing of a U.S. soldier, saying Sgt. Leandro Jasso was “likely accidentally shot” by an Afghan partner. There are no indications he was shot intentionally,” the mission said in a statement. It added the U.S. casualty occurred during an operation to eliminate al-Qaida militants in the southwestern Afghan province of Nimroz, next to the border with Iran. “Early interviews indicate the tragic accident occurred when the partnered force became engaged in a close-quarter battle during an assault on one of multiple barricaded al Qaida shooters,” the statement noted. It quoted General Scott Miller, U.S. commander of the international military coalition, as saying that “the loss of Sgt. Jasso is felt by his family and loved ones, by all who served with him and by all on this mission to protect our country and our allies." There are around 14,000 American soldiers fighting terrorist groups and advising and training Afghan forces battling the Taliban insurgency.